Nazism (or National Socialism; German: Nationalsozialismus) is a set of political beliefs associated with the Nazi Party of Germany. It started in the 1920s. 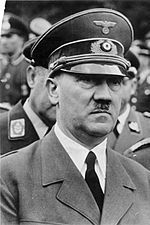 The Party gained power in 1933, starting the Third Reich. They lasted in Germany until 1945, at the end of World War II. Many scholars think Nazism was a form of far-right politics. Nazism is a form of fascism and uses biological racism and antisemitism. Much of the philosophy of this movement was based on an idea that the "Aryan race", the term they used for what we today call Germanic people, was better than all other races, and had the greatest ability to survive. According to the racist ideas of Nazism, the Germanic peoples were the Herrenvolk (master race). The "inferior" races - the Jews, Roma people, Slavs, and blacks - were classified as Untermenschen (sub-humans). The Nazis sent millions of Jews, Roma and other people to concentration camps and death camps, where they were killed. These killings are now called the Holocaust. The word Nazi is a short for Nationalsozialist (supporter of the Nationalsozialistische Deutsche Arbeiterpartei) in the German language. 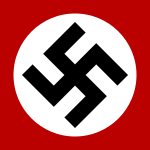 This means "National Socialist German Workers' Party". In the Holocaust, millions of Jews, as well as Roma people (also called "Gypsies"), people with disabilities, homosexuals, political opponents, and many other people were sent to concentration camps and death camps in Poland and Germany. The Nazis killed millions of these people at the concentration camps with poison gas. The Nazis also killed millions of people in these groups by forcing them to do slave labor without giving them much food or clothing. In total, 11 million people died- 6 million of them Jews. After the war, laws were made in Germany and other countries, especially countries in Europe, that make it illegal to say the Holocaust never happened. Sometimes they also ban questioning the number of people affected by it, which is saying that not so many people were killed as most people think. There has been some controversy over whether this affects people's free speech. Certain countries, such as Germany, Austria, and France also ban the use of Nazi symbols to stop Nazis from using them. Nazism Facts for Kids. Kiddle Encyclopedia.